Clarets defender Ben Mee is out to prove that size doesn’t matter when it comes to big battles in the Premier League. Having already dueled with the likes of Fernando Llorente, Diego Costa, Islam Slimani and Charlie Austin, the former Manchester City man is now tasked with attempting to keep Everton striker Romelu Lukaku quiet at Turf Moor this afternoon. The Belgium international has been in scintillating form, netting six times in his last five appearances for the Toffees in the top flight. Lukaku has illustrated that he’s just a big a threat in the air as he is with the ball at his feet and Mee acknowledges that he’ll have to seek savvy ways of gaining the advantage. Asked how he plans to negate the away side’s main threat, he said: “I don’t know; I’ll let you know after Saturday. I’m looking forward to playing up against him. “He’s obviously in form at the minute, he’s one of the best strikers in the Premier League and it’ll be a very good challenge for us. Me and Keano will look to do a job. “He’s a big lad and it’s something I look forward to. I want to show him what I can do as well. People say I’m not the biggest but I want to prove that it doesn’t matter. I can be aggressive in the air whether I’m big or not. It will be an interesting battle. “It’s about being clever and being aggressive. You’ve got to have both. You’ve got to try and be cleverer than your average centre-half. Mee added: “We look at every team we play so we haven’t got anything special lined up. We’ve just got to pit our wits against them. Burnley’s form on home soil has been the antithesis of that shown away from familiar territory. while Sean Dyche’s side have conceded nine goals in three games on their travels, they’ve shipped just six in 18 outings at Turf Moor. 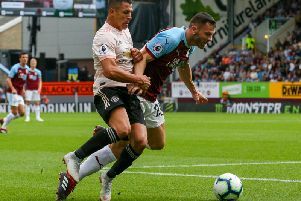 Those statistics, coupled with performances against Liverpool, Watford and Arsenal, will see the Clarets go in to the fixture with the Toffees in confident mood. “Every game is a big game, you never know what can happen, and we’ll go in to it confident because our form has been good at home,” said Mee. “There’s no reason why we can’t go on and put on a good performance. “We are a good solid team at home but we’d like to transfer that to our away form and not concede as many goals as we have been doing.